The board approved starting the process for awarding the 30-year contract to a consortium of seven contractors known as LAX Integrated Express Solutions. After an agreement is finalized between the consortium, airport authorities and the city, the contract will go again to the commission and then to the Los Angeles City Council for a final vote, likely later this year. As the centerpiece of a $5.5 billion plan to modernize road and rail access to the airport, the people mover will connect the central terminal area at LAX with a station for the Crenshaw/LAX and Metro Green light rail lines and a consolidated car rental facility nearly two miles to the east. It is projected to cost nearly $2 billion to build and is tentatively set for completion in 2023. 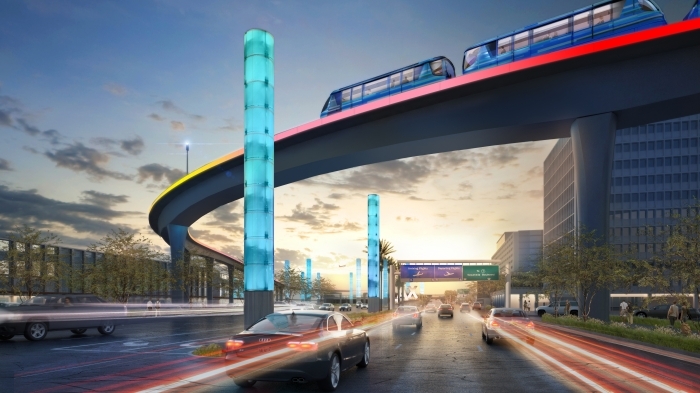 “Today’s recommendation brings us one step closer to a people mover that will provide Angelenos and travelers from everywhere with reliable, convenient transportation to and from the terminals,” Los Angeles Mayor Eric Garcetti said in a statement. Unlike many public infrastructure contracts that are just for design and construction, this contract is to include all phases of the people mover: Design, financing, construction, operation and maintenance. That’s why the contract value is more than double the anticipated construction cost. LAX Integrated Express Solutions (LINXS) was selected from among five bidding teams as the eventual contract awardee. LAWA staff gave it the highest technical score. “We were impressed by their ideas on mitigating traffic during construction, their commitment to hiring local workers, and their focus on sustainability throughout the project,” LAWA Chief Executive Deborah Flint said in a statement.